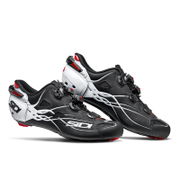 The Sidi Ergo 4 Carbon Composite Cycling Shoes feature two innovative soles for outstanding performance. 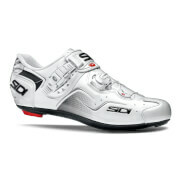 Lightweight and durable, the cycling shoes provide a customised fit for optimal comfort and support. 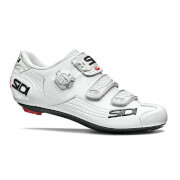 Designed with the latest technology, the Ergo 4 cycling shoes are perfect for professional cyclists. Twelve Carbon Composite Sole: This lightweight racing sole is made from a blend of nylon and carbon fibre. The Nylon ensures the sole doesn't absorb water and keeps its rigidity in hot or humid weather or while it ages. The material blend results in a lighter and stiffer sole. Soft Instep 3 Closure System: Serviceable and replaceable, this wide, padded strap has been coupled to soft, thermo-formed material which improves comfort and performance. Adjustable from both sides for perfect cantering, it evenly distributes pressure over the arch area, eliminating the need for the High Step Extender. Caliper Buckle: A micrometric closure, it's regulated by lifting the central buckle. To open completely, lift both side buckles together, whilst to loosen the closure, the central clip must be lifted. Tecno 3 System: Using a monofilament line and a fine-tooth ratchet, it allows for frontal micrometric closure and helps the upper of the shoe to adapt to your individual foot shape, producing a comfortable and customised fit. Serviceable and easily replaceable, the system also encourages even pressure distribution. Velcro Security System: With integrated locking polymer teeth, this feature allows for a more secure closure by making the Velcro unmovable. Adjustable Heel Retention Device: Easily adjusted, this technology improves the fit of the top of the heel cup around the rider's ankles, preventing slipping during steep climbs and sprints. Simply turn the screw to the + or - sign to either tighten or loosen the fit. Replaceable Heel Cup: This spare part helps to prolong the life of your shoes. Upper: Microfibre Tech Pro/Nylon Mesh. Sole: Carbon.